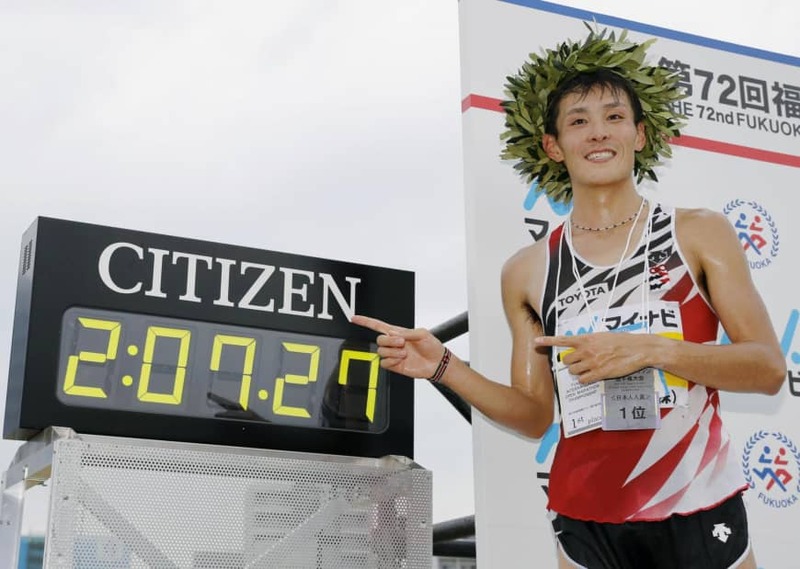 FUKUOKA – Yuma Hattori became the first Japanese runner in 14 years to win the Fukuoka International Marathon on Sunday.The 25-year-old held off Ethiopia’s Yemane Tsegay and Eritrea’s Amanuel Mesel to cross the finish line at Heiwadai Athletic Stadium for his first victory. Japan’s Yuma Hattori has won today’s Fukuoka Marathon in the first victory for Japan since Tsuyoshi Ogata won in 2004. Hattori’s time was 2:07:27, a new personal best by more than two minutes. With six kilometres left, Hattori was able to open up a lead over Yemane Tsegay of Ethiopia and Amanuel Meselof Eritrea, who finished second and third, with times of 2:08:54 and 2:09:45, respectively. Hattori, who had only the seventh-fastest PB among the Japanese men entered, told the IAAF he had increased his training load by 300K per month for this race. He also ran a 40K long run seven times during his build-up, and an ultra-long run of 46K. Tsegaye reported not feeling well, with a stomach ache and a headache in the later stages of the race, but according to Japan Running News is only the third man to break 2:10 fifteen times in his career. Yuta Shitara, who holds the Japanese national record, finished fourth, with a time of 2:10:25. 2018 Boston Marathon winner Yuki Kawauchi was not able to sustain the relatively fast pace past 11K, though he made up a lot of time after the 25K mark, finishing 10th, with a time of 2:12:03–his 50th sub-2:14 clocking. British runner Callum Hawkins was forced to withdraw recently due to injury. It was here at Fukuoka that Jerome Drayton set the Canadian record of 2:10:09 back in 1975 that stood until last month, when Cam Levins finally broke it with his 2:09:25 finish at the Scotiabank Toronto Waterfront Marathon.